Hawaii Volcanoes National Park will reopen its main gates Saturday. 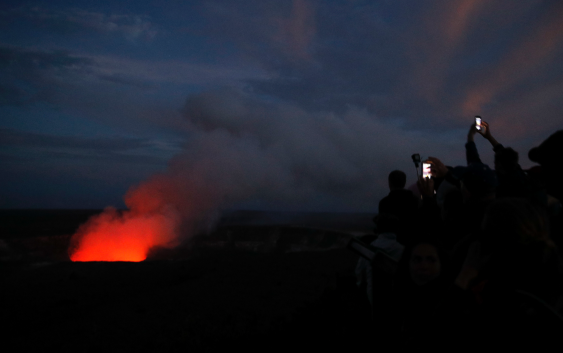 Officials are bracing for long lines and crammed roads as visitors flock to see Kilauea’s new landscape and the area where a well-known lava lake once bubbled. The reopening also coincides with National Public Lands Day, so admission is free. “We are projecting well over 5,000 people just in one day,” Hawaii Volcanoes National Park acting spokeswoman Shanelle Saunders said. While interest is high, accommodations will be somewhat limited. Damage to the park closed about 30 percent of its former parking capacity. “We’re really expecting long lines, and we hope people have plenty of patience when they’re trying to get parking spaces,” Saunders said. There’s still no access to clean drinking water in the park, and the summit’s Jaggar Museum remains closed, she added. The national park — normally the state’s most-visited tourist attraction — has been closed for 135 days as volcanic activity caused explosive eruptions, earthquakes and the collapse of the famed Halemaumau crater. Ash clouds shot skyward from the summit crater and blanketed the region in volcanic debris. The summit crater floor sunk 1,500 feet (460 meters), and the overall Kilauea caldera widened — expanding from about 200 acres to over 1,000 acres, or more than 1 square mile, according to the U.S. Geological Survey. However, one of the park’s biggest draws — the radiant red light from the 2,000-degree lava lake that has been a Kilauea hallmark for over a decade — is completely gone. Regardless of when the park reopened, officials expected big crowds. “If we reopened on a Monday in the middle of the school year, it would still be busy because people really want to come in and come back to the park,” she said.